I thought since my Irlens has come up on radio interviews, on videos and more recently at a production course I was on, that I might write a bit about it here. I was only screened for Irlens 2 or 3 years ago. It came about after a friend watched me walk into door frames, frequently miss the desk with my elbow at work and finally, when I talked about seeing numbers and music as colours. She suggested I get screened. At my screening I discovered for the first time that for most people, words do not move on the page as you tried to read them. It had never occurred to me that what I see when I look at writing on a page is different from other people. I have always had to chase the words around, try to track them onto the following line, watch them fall into a kind of whirlpool and try to read them as they disappear. I thought this was perfectly acceptable type-face behaviour. Apparently not, but why would you question this as a child when everybody else is reading quite happily and they don't seem to panic at reading comprehension. I was diagnosed after I had completed my Degree with the Open University and worked for 5 years reading text books and writing essays, whilst working full time. I scored as having quite severe Irlens, I have four colours in my glasses and they are rather dark. I recently came off stage wearing my Irlens glasses and someone said to me "you play pretty well for a blind person". Well firstly, a person with a vision impairment can play music well, but secondly, why would anybody say that? I get looks and comments about my glasses every now and again. I got less looks when they were a lilac purple colour, but now I get that look that says "you diva, why are you wearing sunglasses inside?" 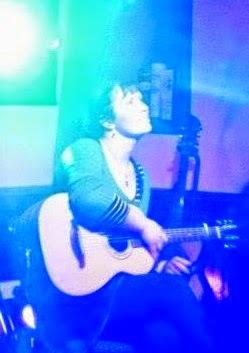 I wore my Irlens glasses on stage for my album launch and hated the photos as a result - vain, vain, vain! I don't wear my glasses very often now and take the view, well I didn't have them for most of my life, what difference does it make now? The truth for me is that the glasses actually make a huge difference. I can study longer and without straining my eyes so much. The lenses slow the words down on the page and cut out the 'glare' that makes me squint. I react really badly to blue lights. This is now the most fashionable lighting to put in venues - it leads me to forget my lyrics, chords, song order and generally flusters me! For my album launch I requested that there be no blue lights in the rig. I however, forgot to mention that I would be wearing a green dress. The lighting guys took out all of the blue lights and replaced them with green - I looked like an alien! I understand that the earlier children are screened for Irlens, the more likely it is that their lenses can correct the way their brains react to light. I think its a bit late for me - especially since I do not religiously wear my glasses. But every now and then I have a revelation. I think to myself - 'Oh, so that's why I do that!' I'm not sure if my seeing music has any link to me having Irlens. The two things might be entirely unrelated, but I wrote 'dancing around' about how I see the world and about the big void that I sometimes feel when I realise how different this is to everyone else. The song was used by Irlen East last year as part of Irlens awareness week. I also got interviewed about my experiences of Irlens. The truth is, I'm not a very good role model for people with Irlens as I am not very sympathetic with myself and definitely make things harder for myself. But maybe someone will read this and think, 'maybe I should get screened?' Maybe their whole perspective will change, and maybe, that's something that I can do. So our second songwriting brief was set by Gary Clark who has written very successfully in the pop arena, providing hit songs for artists. We had to choose an artist from a list of 5 and pitch a title and concept idea for the song. I started by researching each artist/ group. I watched two videos on youtube and read the Wikipedia for each, then having decided on Demi Lovato I did a lot more research on her. I looked more into her interviews and where she planned to go, than into her historic songs as I thought this would give me more of an idea what she would connect with. My research took me to her interview in the Daily Mail, cosmopolitan magazine, Seventeen Magazine (for which she is an editor) and Fault Magazine. I watched some of her interviews on Youtube and tried to get a sense of who she is and where she hopes to go. 'Demi Lovato has grown up and developed in the public eye. She has openly struggled with issues of bipolar, addiction, self harm and eating disorders and repeatedly released work in the face of these to critical and commercial success. Now an ambassador for child mental health charities, LGBT, anti-bullying, conservation and more, she says that she wants to be a ‘beacon of hope for the next generation’. She has written about being a warrior and a survivor, I would argue that her next step is to be a pioneer and continued role model for her younger fans. So far so good. The pitch was accepted and so to write the song. Interesting that I have never written a song for anyone other than myself. Part of my reason for choosing Demi Lovato (aside from that from my reading she seemed relevant and genuine), was that in trying to write for somebody else for the first time I had no intention of trying to write for a boy band in the process. That may be my next leap, but one step at a time. Now for the tricky bit. How did I actually go about writing the song? I have been trying to work that out for the whole semester. During collaborative songwriting week I wrote 4 songs with 4 different people and I really enjoyed trying out new approaches to writing. Some people like to write melody up, meaning that the lyrics came after the chord structure and approximate melody was in place. Others start with the lyrics and then create a melody to complement the words and a backing to convey the right mood. I enjoyed trying both of these styles with my writer colleagues. When I write on my own I start with an idea. It could be an interaction I've seen between two people on the street, maybe something has caught my eye or a story has moved me. So starting with a songwriting brief doesn't really disrupt my writing approach. The idea then marinades in my head for a while, a bit like forming links between images or sorting through other things that come to mind. At some point I will then get the urge to sit at the piano or the guitar and it all comes out in free flow: lyrics, melody and chords all together. Hence struggling to dissect the process. I think that this fluid way of writing must stem from the way I developed my writing. My mum laughed recently when she saw my niece singing along to a game, making up the words as she went. This tickled my mum because she had watched me sing my world since I could speak. Mum was a music teacher and dad was a multi-instrumentalist. I carried around my brown fisher price tape recorder, sang and slept in my dad's guitar case. Songs were improvised and instantaneous. The words were never really written down, so they were never worked and reworked. The song that instinctively came out of my mouth when I sang was the right word because that was the song of the moment. As I got older, whilst words might have been altered along the way, the songs still emerged relatively fully formed. When writing 'Hey Little Sister' I came to the piano with slightly more format than to see what I would instinctively write. Firstly, this was to be a pop song and it had to meet the pitch that I had so optimistically written. I knew that the melody needed to be simple enough to be catchy, the chords needed to be relatively open and the overall feeling of the song needed to be that of 'hope'. The kind of song that girls on a night out would sing to each other at the top of their voices because it made them feel good. Logically I felt that 'hey little sister' was a verse line and not a chorus, because the chorus needed to contain a direct mantra - no fuss or frills. I knew that the second line to my chorus would finish with the word fate and that I wanted a buzz word within the first line that everyone would instantly understand without it having been used so many times that it has become cliche. Elevate! And now to disappoint.... after mechanically reaching all of these decisions about the song and setting out my boundaries, the song just flowed out fully formed. I had to then put my craftsman hat back on to edit the song down from over 4 minutes down to its current 2:14. The bridge/ refrain also didn't come until the day before I recorded the song, but again, it just emerged. Sorry! We had great fun in the studio. 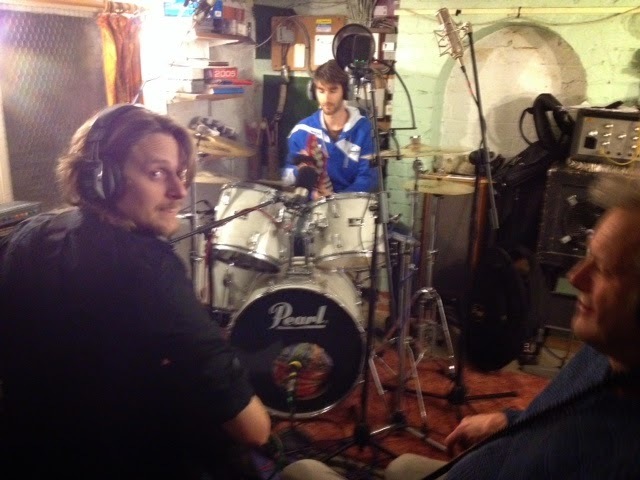 I had Kev Abbott on drums, Steve Mann on bass, James Morgan on electric guitar and me on keys and vocal. Four jams through the song and a second take recording of keys, drums and bass. Electric guitar was then overdubbed and vocals recorded the next day. And all of this from my meager beginnings with a fisher price tape player. My hunt for exactly how I write songs continues, but its good fun working it out.